Article: How Can We Finance the Resilient Cities of the Future? Article published by the World Bank on October 12, 2016. By 2030, without efforts to boost urban resilience, climate change may push up to 77 million more urban residents into poverty. The world has a brief window of opportunity to make cities more resilient, but it will take a significant amount of funding—especially for developing countries. 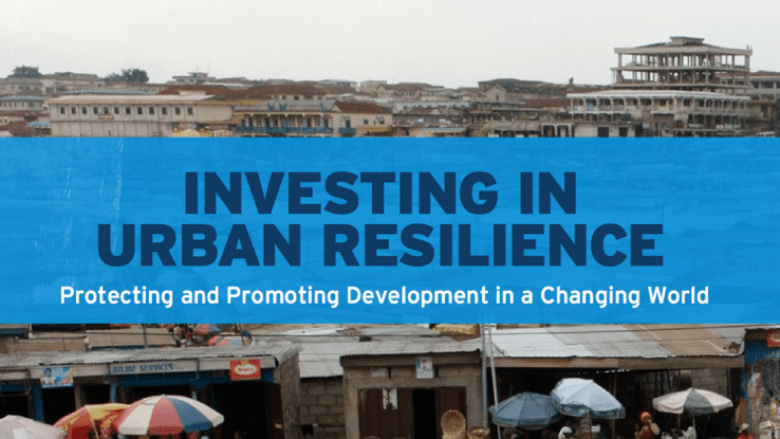 A new report discusses the challenges and opportunities of unlocking investment in resilient infrastructure for improved urban livelihoods worldwide. By 2030, without significant investment to improve the resilience of cities around the world, climate change may push up to 77 million urban residents into poverty. Those are the findings of a new report by the World Bank and the Global Facility for Disaster Reduction and Recovery (GFDRR), released in advance of the United Nations Conference on Housing and Sustainable Urban Development (or Habitat III). Investing in Urban Resilience argues that climate change and increasing urbanization may have devastating effects, and that they will strike hardest at the biggest drivers of global development: Cities. If cities fail to build their resilience to disasters, shocks, and ongoing stresses, climate change and natural disasters will cost cities worldwide $314 billion every year by 2030, and 77 million more people—or more than the entire population of the Democratic Republic of the Congo—will soon be living and laboring in the shadow of poverty. The low resilience of growing cities is particularly dangerous to the urban poor. Globally, 881 million urban residents are living in slums, up by 28% since 2000. These informal and unplanned settlements are often built in high-risk locations, such as slopes or floodplains, and lack basic risk-reducing infrastructure. But there is reason for optimism. Almost 60% of the areas that will be urbanized by 2030 haven’t been developed yet, which means that the world has a brief window of opportunity for investment—but it will take a significant amount of funding. Research has estimated that, worldwide, the need for urban infrastructure investment is $4.5 trillion per year, and that making this infrastructure low carbon and climate resilient will take a premium of 9% to 27%. Much of this demand comes from cities in the developing world. The funding to do it is out there: between public, private, and philanthropic sources of funding, there is $106 trillion of private institutional capital available worldwide. Yet, right now, only 1.6% of it is invested in infrastructure at all, let alone in making that infrastructure resilient. Why such a large funding gap? Lack of government capacity. Cities may struggle with political uncertainty, regulatory systems that deter private investment, and difficulties planning, financing, and implementing projects. Lack of private sector confidence. Private-sector investors are frequently concerned about limited institutional capacity, weak governance, currency risk, and limited benchmarking data that can be used to measure an investment’s performance. Challenges in project preparation. The technical capacity and upfront costs needed to prepare projects mean that cities are able to offer few ready-to-go urban resilience projects to investors for financing. 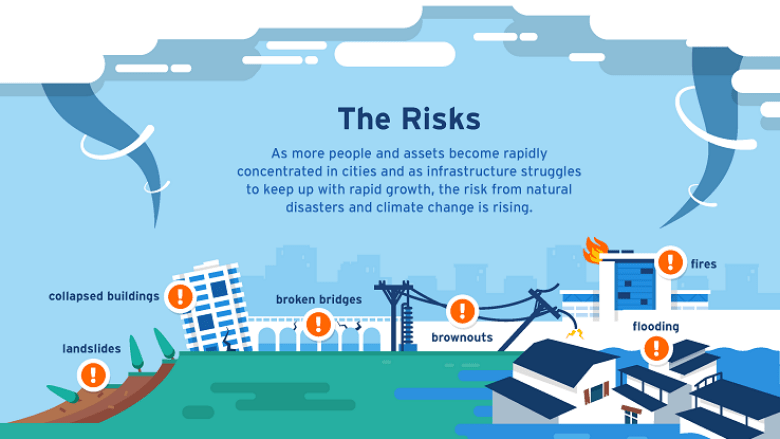 To help cities overcome these barriers and boost investment in urban resilience, the Bank has invested an average of $2 billion a year in building resilient cities over the past five years, working on 79 projects in 41 countries. In Istanbul, for example, the World Bank and GFDRR helped improve the city’s earthquake preparedness by making more than 1,000 buildings—including schools and hospitals— safer for over 800,000 people. The Bank also aims to make a global impact on the worldwide urban resilience agenda through its far-reaching partnerships, including the 100 Resilient Cities network and the Medellín Collaboration on Urban Resilience. These multilateral partnerships are crucial for leveraging private funding. But it’s going to take more than money to increase urban resilience: it will take a focus on improving the policy environment in cities so that investors are willing and eager to fund resilience projects, and boosting the capacity of local governments to implement them. These are the key themes that the World Bank and GFDRR will bring to Habitat III, where their will share the Investing in Urban Resilience report and help forward the conversation about how to build the resilient cities of the future. This entry was posted in WBG News & Reports and tagged Cities, Climate Resilience, Financing, Future, Urban Resilience, Urbanization by NL4WorldBank. Bookmark the permalink.